La Jolla, CA, USA — February 24, 2015 — MadCap Software, Inc., the leader in multi-channel content authoring and a showcase company for Microsoft (NASDAQ: MSFT) Visual Studio, today announced that it has published a new case study on eLearning Innovation. A leader in creating interactive learning environments, eLearning Innovation uses MadCap Flare for single-source publishing of HTML5 course content, streamlining the process of creating and updating content for a growing number of online courses. The full case study can be viewed at: https://www.madcapsoftware.com/casestudy/elearninginnovation.aspx. Since 2003, eLearning Innovation has been providing instructional design services to higher education, K-12, corporate, government, and non-profit organizations. Specializing in experiential learning, eLearning Innovation creates active learning environments that inspire and educate. Today, leveraging Madcap Flare’s single-sourcing functionality along with its own custom integration, eLearning Innovation delivers robust online courses directly to a Learning Management System (LMS). common practice in course development is to create content in Microsoft® Word and then manually copy and paste it into an HTML editor in an LMS. eLearning Innovation develops hundreds of online courses a year and realized it needed a more-scalable, less error-prone solution. 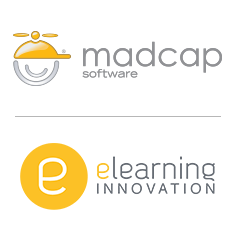 eLearning Innovation now uses Madcap Flare, along with a custom integration, to create and maintain online courses. Using Flare, eLearning Innovation develops course content and then publishes it to its content server. Through a custom integration, the course content is served directly from a link in the LMS. Taking advantage of Flare’s capabilities for single-source publishing, eLearning Innovation can create content once in Flare, publish it to their content server, and link to it directly from an LMS, streamlining course production and maintenance. Snippets, variables, and condition tags allow eLearning Innovation to easily customize content for different roles and audiences. Flare-based content is integrated with analytics via custom technology eLearning Innovation has built using the Learning Tools Interoperability (LTI) specification for real-time insight into users’ experiences with the content. Proprietary code will be embedded into Flare content that when viewed via the LMS will display a quiz, survey, or a performance-based assessment and its associated rubric. Using Flare condition tags and proprietary technology will enable the display of different versions of the content for different audiences. eLearning Innovation, LLC, provides instructional design services to higher education, K-12, corporate, government, and non-profit organizations. Specializing in experiential learning, eLearning Innovation creates active learning environments that inspire and educate. Institutions and organizations interested in learning more about eLearning Innovation’s custom eLearning solutions can contact Laurie Pulido at 1-844–435-3276 or visit www.elearninginnovation.com.